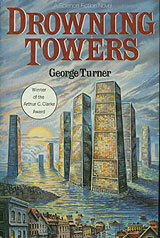 The jacket to Australian science fiction writer George Turner's latest novel, "Drowning Towers," is covered with glowing praise from a half-dozen respected writers and a medallion proclaiming it winner of the "Arthur C. Clarke Award" for best science fiction novel published in Great Britain in 1987. And yet, after a careful reading of the book, one is likely to feel an overpowering urge to ask, "So what?" "Drowning Towers" is the story of the collapse of our civilization (the "Greenhouse Culture") as told through the eyes of a family living in Melbourne in the years 2041-2061. Actually, the telling is secondhand  an anthropologist from about 3050 has reconstructed the collapse of "old" Melbourne from her diggings and presented it in novelized form, which constitutes the bulk of "Drowning Towers." The few glimpses given of Turner's world 1,060 years from now are fascinating (Christianity survives; space exploration has died on the vine), but are mere scraps tossed out as scenery on the way back in time to the Conway family of AD 2041. The Conways' world is economically polarized, with "Sweet" living the high life and "Swill" (little more than futurized Cockneys transported to Australia) shut up 70,000 to a supertenement. At the start of the novel-within-a-novel, the Conways are Sweet, but automation causes the father to lose his job (women have apparently lost any gains made in the last 20 years), tossing the family to the Fringe, or almost-Swill. As Sweet, the Conways were hidden from the reality of the Greenhouse Effect on the environment. The Swill Towers, no longer hidden from the Conways but only a few hundred yards from their door, are regularly flooded by the rising ocean while the Sweet houses sit safe in the higher parts of town. At this point, "Drowning Towers" loses cohesion and tries weakly to be both an adventure-mystery and a social diatribe against our times and where they're taking us. Neither is accomplished with any effectiveness. The plot of the mystery concerns the two Conway boys, Teddy and Francis. Teddy becomes a policeman ("copper"), while Francis hires himself out to Sweet embezzlers. But the story takes too long to develop as Turner explains, in great detail, all the facets of life in Australia 60 years from now. By the time Teddy is forced to confront Francis' distributing among the Swill a disease-carrying drug that sterilizes those infected, not only does the reader not care, but apparently the author doesn't either. The ending is too neat, too happy and too tight to be believable. Worse than the rushed tie-up of the main plot is the fact that Turner introduces but never explains another plot line right at the end of the book. From the glimpse given, it could be a lot more interesting than the story he did give us. Perhaps he's saving it for a future book. If "Drowning Towers" is a disappointment as a thriller, it is equally so as an examination of current social and ecological policy. Turner's warning that endless polluting of our planet cannot continue is well taken, but his method is too full of holes to allow this book to be considered as a serious contribution to modern cultural criticism. Marin spoke like one who sees no need for shock. "Throughout history, poverty was the lot of the common man." Lenna glanced at him with mild surprise. "Yes, we tend to forget that. We see the monuments and forget the millions who starved to raise them." Andra shivered, not with cold. "At least we have eliminated that from the world." "The interesting statistic," she said drily, "is the number of millennia it took us to learn how to do so, though it was always easy and we always knew it." There are any number of intelligent men and women who have worked long and hard to eliminate poverty and who would like to know Turner's "easy" formula. It's unfair of him to not share.